Winter Storm “Ion” (The Weather Channel gives big snowstorms names, apparently) has been plowing through the Midwest, bringing frozen precipitation and frigid temperatures. You know this is a real storm due to the many school cancellations and business closures in places where things don’t usually get canceled, including in the “toughest” of the winter states like Wisconsin and Minnesota. The Amish around us are staying home tomorrow (Sunday). Polly Lambright said some districts let the members know they are canceling church, other districts just expect members to not show up if the weather is dangerous. Polly’s husband Galen said that as a child he remembers the weather being so bad that no one showed up for church at their house one week. They rescheduled it for the next week and bad weather came and again no one showed up. This happened the 3rd week as well and they gave up trying to have church at their house and ended up moving it to the next house in the cycle. Polly also said she remembers as a girl going to church and while the service was going the weather turned bad. On the way home the horse died and they had to walk home in drifts that were up to her chest. Since Amish have church in neighbor’s homes often less than a mile away, you’d think that would be easier than traveling by car long distances over treacherous roads. On the other hand, roads can be dangerous no matter the vehicle you are in, and there are exposure risks for animals and humans alike. They are having church in the district north of us. But the only buggy I saw on the road this morning was one neighbor leaving. Sunday mornings are usually a very busy time. How have you been affected by this winter storm? This weather is wreaking havoc for so many in the U.S. right now. I can’t imagine attempting to travel by horse and buggy in these frigid temperatures! If your talking about the system that was supposed to grip the golden horseshoe, Toronto through to, very broadly, the Niagara Falls New York State boarder area, my area didn’t get weather beaten as bad as they forcasted, as we often get weather that seem to originated in the central parts of the USA. Hype is what it was, some snow did fall, I look out my window and there are people shoveling, but nothing debilitating like the snow and ice storm that did shut down a large chunk of the province the weekend before Christmas. I had power during the time between the 22nd and the 25th, but many people did not, at least they didn’t for a few hours up to a day, others lost power apparently through to and past Christmas. In fact I trudged to my work Christmas party on the Sunday of the ice storm and witnessed downed power lines and flashing or not lit street signs. Because of the crummy weather the party was canceled. Sometimes you just have to plough through. I hope everyone is okay though. Fortunately I live in Florida. But I do have family up north who are snow bound with doors in their homes frozen shut. Here in central Florida we are going from 80 to 30’s in 24 hours. I moan and groan until I check the weather in Ohio, where family lives, and see temps in the minus range. That is when I say a prayer of thanks that I live in the south. Well, since we are here in North Carolina, we really aren’t in the same shape as folks in the Mid-West. It’s supposed to go down to 8 degrees here tonight, a little colder in the mountains, so we’ll just leave the water running a little and make sure the chickens are secure. Our prayers go out for those who live in the path of the storm. From East Central Iowa: With wind chills forecast to be 30 to 50 below zero today we have no school. Lots of cancellations. Most people stocked up on food, put gas in their cars, farmers got livestock inside or up near the buildings. Then the main concerns were exposure, losing power, or frozen water pipes. None of which I have heard being a problem close by. I’m off to work at noon, a few minutes drive, if the car starts! We are under travel restrictions in our county. Travel is illegal except for emergency vehicles. However I just saw a buggy go by. Either they didn’t get the message or think it doesn’t apply to them. At -35 windchill I hope they make it safely! 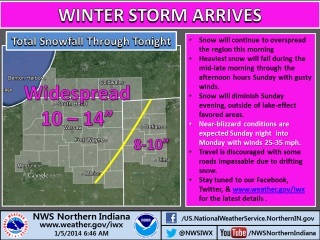 I saw something similar for Indianapolis in the Weather Channel report, was a little surprised by that. I thought I might mention it in this post, but wasn’t sure whether to call it a curfew or something else…hadn’t heard of restrictions on movement outside of wartime or martial law situations. If that’s the case, it seems there are cases when authorities are able to keep you in, but not move you out (as when hurricanes hit and people are ‘strongly encouraged’ to leave but choice left to them). >Travel is illegal except for emergency vehicles. I think you’ll find that is nothing more than a strongly worded request. Very few states have any legal teeth behind these requests, and then usually just apply to limited access highways when they barricade the entrances. I’m certainly not old enough to know, but I suspect buggy travel is as difficult as automobile travel in these conditions…back in 1900 folks would’ve been switched over to sleighs and sleds for winter since they knew the roads would never be plowed. Though I’d suspect they would have trouble in snow drifts too! I remember reading when Connecticut began plowing state roads around 1910 they promised in rural areas to leave at least 4″ of packed snow on the roads to allow for travel by sleigh. One man said in PA it almost isn’t worth having a sleigh anymore, because when it snows, the roads are quickly cleared and there is no snow on the roads for a sleigh to travel on. Maybe people can sleigh across the fields if there are less fences in use. It sounds like Indiana may have had the snow on the road, but it was too cold to be outside. What would be the ideal conditions to go on a sleigh ride? I’m having my husband (who drives an SUV) take me to my library job for my usual 1 pm-9 pm Monday workday. I don’t want to put more stress on my almost 13 yr old Corolla than I have to. Since the governor has designated public libraries as “warming centers”, it’s unlikely they’d close, no matter how difficult it may be for staff to get to work (roads plowed, but still icy, and a leaving your car sitting in a parking lot exposed to Westerly winds -pretty wide open area of farm and parkland to our west–which means some just may not start tonight). Yes, we do go out to start & run our cars, but locks freeze, too. But as I said, we’re “warming centers” for the public. We were without power for 5 1/2 hours on New Year’s Day. We found out from Com Ed that only ourselves and our next door neighbor were on the “box” that failed! And it was likely due to work a sub-contractor did last summer, for the “Smart Grid”–which was NOT “smart enough” to detect our outage! !–that was at fault. So, I resorted to my old oil lamp, lantern, candles, and thank God the very well-bundled Com Ed crew managed to fix the problem! Then, however, the winds came. Fri. night, just after midnight, a piece of our aluminum siding came loose. My husband & I were out there in the dark, nailing it up (with me holding the ladder & flashlight in the brutal wind). The next day we were out there again doing a “better” fix. The whole time, I was thinking about the Amish who must tend to their horses, other animals, in this cold, no matter how brutal the weather is. God be with everyone who needs (or gives) help in this “polar vortex”, as they’re calling it. just get out and shovel ourselves out and go on down the road. Here in southeast Michigan all public schools are closed for the second day. Most people just didnt go to work yesterday as the roads were impassible. We had around a foot of snow followed by the “artic vortex” Fortunately my wife and I were able to dig out before the really cold air came in but today its currently -12 with wind chills in the -30″. It looks like the wind blew the snow into dunes like sand dunes. Oooo, that stranded buggy photo literally makes me shiver (unusual for me, I’m usually too warm). I sure hope the poor horse is nice and snug in a cozy barn. I’m a little surprised that sleds aren’t used, but then, I guess if they’re headed into town, sleds might not work (or be allowed?) on “city” streets…does anyone know? The last several mornings have found temps of -4 and -8 at my farm. The sub zero temps we’ve been having have affected my chickens’ egg production. When I went out to the henhouse the past two nights most of the eggs had frozen solid and split wide open. The hens are doing well, they’re savvy enough to tuck their heads underneath their wings at night to sleep, however, I lost about two dozen eggs as a result of the cold. The weather has also meant a few more trips to the woodpile to fire the stove up. Hope you’re keeping warm wherever you are!! Today the temps went back up to the low 20’s!! It’s almost balmy compared to what we’ve been having.